The 4thWay® PLUS Ratings of peer-to-peer lending accounts and IFISAs are intended to be an easy way for individual lenders to estimate at a glance whether the interest they earn, combined with any safeguards against losses, are sufficient to protect the average lender from losing money from bad debts in recession and property crash scenarios. The 4thWay® PLUS Ratings are calculated cautiously and have an in-built margin of safety to further increase the chances that lenders will be satisfied with their results. The 4thWay Risk Scores focus on the scale of losses in a severe recession, but they do not take into account any interest you earn to offset those losses. Who created the 4thWay PLUS Ratings and 4thWay Risk Scores? The 4thWay PLUS Ratings and 4thWay Risk Scores were created by a senior credit specialist, a senior quantitative risk modeller (i.e. someone who helps banks improve their lending) and experienced investors. What are the 4thWay PLUS Ratings? The 4thWay PLUS Ratings are calculated to tell you under what scenarios the average lender might expect to lose money in a given peer-to-peer lending product, account or IFISA, provided you have spread your money across a lot of loans and P2P lending sites, and you are willing and able to hold onto the loans until they are all repaid. The 4thWay PLUS Ratings take both the risk and reward into account. This means, taking into account the interest you have earned (the reward) versus the risk of losses after loans go bad, after attempts are made to recover that bad debt, and after payouts from any reserve funds or other protections (so-called “credit enhancements”) that the P2P lending site or IFISA provider offers you. 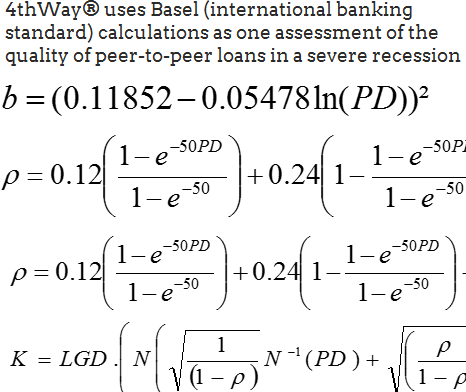 The 4thWay PLUS Ratings are based on the international Basel tests that banks are required to do, but to a tougher standard. More on the methodology further below. The 4thWay PLUS Ratings are indicators, not guarantees or promises, so please don’t use them without supplementary research. Any 4thWay PLUS Rating is good as it means we believe the average lender will make a profit due to the quality of the loans, the interest earned, and due to any security or other safeguards in place. The top rating of three PLUSes is based on calculated results during a severe recession and deep property crash. If you lend across a basket of +++ Rated lending accounts, we expect the interest most lenders earn will more than cover losses, if you suffer any, by the time all your loans are repaid. If you lend in a basket of ++ Rated lending accounts, we expect the interest most lenders earn by the time the loans are repaid will more than cover losses, if any, that are made during a moderate recession and property crash. Roughly speaking, bad debts could be around two-thirds as much as during the severe recession – on average. In a major recession the average lender – particularly one who is not re-lending money regularly – might lose money for a time in some of their ++ Rated accounts. Major recessions are few and far between. We never know when these will hit in advance, but in Basel they are called one-in-100-year events. In addition, lending and re-lending your money before, through and after a moderate or major recession should greatly reduce the risk of losses and improve your returns throughout the downturn. Some ++ Rated accounts offer more opportunities to diversify and they might sometimes offer significantly different kinds of lending. That gives you another form of protection, because while some types of borrowers go through a bad patch, other types will be doing just fine. In addition, you can potentially earn higher interest rates with ++ Rated accounts. Lend across a basket of + Rated lending accounts and we expect the interest most lenders earn will cover the losses, if any, during a blip in the economy and property market, by the time your loans are repaid. Most likely, at least some of your lending accounts with a single + Rating will also do fine in more difficult times as well. If not, you will need to consider re-lending through the good times. Some of the ++ and +++ Rated lending accounts will sometimes drop to the + Rating when lenders pile in too much, which drives down interest rates. Again, though, you might potentially enjoy greater diversification and often higher rates by lending a small amount through some + Rated accounts. If a peer-to-peer lending account or IFISA product is not rated, it means it has not passed our standard tests. Perhaps the peer-to-peer lending website doesn't have a long enough history to be rated using the Basel method, or it hasn't provided us with the data we need, or its results have been poor. Whatever the reason that an account is unrated, some of these products will end up as disappointments for lenders. If you do some digging, sometimes you'll find hidden gems among the unrated peer-to-peer lending sites, because they have very attractive skills, processes and early results. These are likely to become rated when they have a big enough history and in the meantime they can pay high interest rates to compensate you for the greater unknowns. As a starting point, read 4thWay's Quick Expert Reviews in the peer-to-peer lending comparison table or the P2P IFISA comparison table. What are the 4thWay Risk Scores? The 4thWay Risk Scores look solely at the risk side, by taking account of the scale of potential losses from bad debts in a given peer-to-peer lending product, account or IFISA in a very severe recession or property crash. Unlike the 4thWay PLUS Ratings, the 4thWay Risk Scores don’t factor in the interest you might earn. As with the 4thWay PLUS Ratings, the 4thWay Risk Scores assume that you spread your money across lots of loans, using multiple peer-to-peer lending platforms to do so. Usually, the higher the 4thWay Risk Score, the greater the range of results from lender to lender, especially in a major downturn. The 4thWay Risk Scores are a score from 1 to 10 out of 10, with 10 being the highest risk and 1 the lowest. 1 out of 10, in practice, is out of reach of all peer-to-peer lending products and IFISAs, since that is equivalent to the risk in savings accounts. Roughly speaking, 8/10 is equivalent to stock market risk and 10/10 is more equivalent to the risk of investing through a stock market in a poorly-regulated and politically unstable country. The 4thWay Risk Scores are indicators of average losses from bad debts, not guarantees or promises, so please don’t use them without supplementary research. These are lenders' average results; some lenders can achieve worse results through bad luck. The best way to reduce bad luck is to lend across lots of loans. Usually, the higher the 4thWay Risk Score, the more loans you need to spread across. These are lenders' average results; some lenders can achieve worse results through bad luck. The best way to reduce bad luck is to lend across lots of loans. What is the methodology for awarding – or withholding – 4thWay PLUS Ratings? Firstly, a P2P lending site has to provide us with a huge amount of background information through forms, interviews and Q&A sessions with one or more of 4thWay's experts. Most of this will not be used in the rating itself, but without it we do not feel comfortable going on to assess them for a rating. The background information includes a lot about its structure, its results so far, costs, special features, how it is financed, a variety of risks and, above all, about its people and its processes in selecting loans, monitoring loans and recovering bad debts. You can find a lot of this information in the very detailed comparison pages on 4thWay, which hold over 100 pieces of data and information, as well as in our expert reviews. We won't always be able to warn 4thWay users off every P2P lending site or IFISA provider that turns out to commit financial crimes or that becomes guilty of plain stupidity, but our record so far has been good. We believe it is difficult for P2P lending sites to hide their true nature when they go through our rigorous assessments, especially as we continually improve how we conduct our assessments as time goes by. The 4thWay PLUS Ratings assess the interest rates on one side. On the other side, it considers the main risk to lenders, which is the risk that bad debts get too large. What the 4thWay PLUS Ratings don't do is take into account other types of risks, so you need to read up and research more on any given offer. One of the risks that bothers some individuals doing peer-to-peer lending (probably too much) is the risk of a legitimate P2P lending website going out of business. While we don't take that risk into account in the actual rating calculation, if we spot a very obvious, very imminent collapse on the cards, we will remove its rating and send out an email alert to our newsletter subscribers. The 4thWay PLUS Ratings are not an indicator that a P2P lending site is financially strong, or that it won't have to close down and enact its obligatory back-up plans to wind down existing loans smoothly. To conduct the Basel assessments, we need to regularly receive a log of every loan that has ever been approved, along with key details of those loans, including, among many other things, the current status of the loan and the value of any security. We also need details of any additional protections that the provider offers, such as the size of any reserve fund it has segregated for the exclusive purpose of covering expected bad debts on lenders' behalf. Depending on the type of lending, we require a minimum number of loans that have been around for a minimum length of time. For lending to buy-to-let landlords the minimum number of loans required is a lot smaller than the history needed for personal loans, for example. We apply this standard equally to all P2P lending websites. We then assess the quality of the information and the size of the history. If a P2P lending product has only just passed step five, we deduct standard penalties until the data quality or the length and depth of its loan book increases further. We also look for specific warning signs of interest to professional bank risk modellers, and penalise if we find them. For example, one of the key ones is whether the loan book is heterogeneous and monotonous – a rather pompous piece of specialist banking jargon to mean that the loans look consistent and that the risks move smoothly in line with the interest rates charged to borrowers. Another example practice we look for is regrading, e.g. when a platform changes a borrower from A+ to C on its own rating scale. This could reveal the provider is poor at assessing borrowers in advance. If we find severe flaws, we simply refuse to allow a rating altogether. Sometimes individual loan books or peer-to-peer lending providers present us with unique problems, such as when they don't give us enough information to know how their individual loans are split between different lending accounts. In those cases, we always take a very cautious approach to tailoring the assessment, so that we assume the worst imaginable split for each lending account. If even a cautious assessment is not possible, we simply refuse to offer a rating at all. We have a fixed procedure for how we go about this, so that we maintain consistency. At this stage, we are now ready to look into the meat of the matter. We look at how many loans are late or that have gone bad. Importantly, we look at the types of loans on offer. We look at the size of the security compared to the loan size. We factor in any reserve funds or other defences. And we look at the interest rates lenders are offered. If there is enough history and detailed information, we will look at the P2P lending site's performance in recovering bad debts. Otherwise we just assume poor results compared to typical banks. Based on all the factors in step eight and the penalties in steps seven and eight, we then do the Basel calculations that banks are required to do across the globe to see whether there is a serious risk of losing money due to bad debts. Unlike the banks, we stress test to see the risk of losses in what we call a 1-in-100-year recession, so a severe recession. Plus, for property lending, we assume distressed sale prices during a property crash of 55% below the initial property valuation. We then see if it earns enough interest and has enough other defences to prevent losses to the average lender. If the P2P lending account passes those tests, it earns the top 4thWay PLUS Rating. If it passes softened tests, it can earn one of the other two PLUS Ratings. Poor P2P lending sites cannot earn a rating. Throughout, we make very cautious assumptions. For example, we assume that all late loans will turn into bad debts. Another example: we assume that any security is worthless if it is not properly valued and no decent legal claim is put on it in the contracts with the borrowers. We don't stop there. We continually monitor how we can improve the methodology. We make a lot of minor improvements throughout the year and every year or two we do a major upgrade. What is the methodology for awarding – or withholding – 4thWay Risk Scores? The 4thWay Risk Scores are based on the same methodology as for the 4thWay PLUS Ratings. The difference is that the assessment excludes the interest earned and just looks at the results in the toughest disaster scenario: the severe recession and major property crash. It is an assumption on our part that you will sensibly spread your money across lots of loans and different P2P lending sites. And we assume that you will keep lending till the loans are repaid, even if there is a recession or other disaster. That is the basis upon which the 4thWay PLUS Ratings and 4thWay Risk Scores are made. Please take the time to learn more and research more, understanding the investment opportunities to an ever greater extent, so that you can refine your choices and feel more confident, especially during recessions. It is during downturns that investors with little knowledge then go on to panic, try to sell, and find the only way to do so is to sell their investments – in this case their loans – to other investors for a cut price. Those buying for a cut price are laughing. Those who confidently held on throughout will usually come out just fine. Please see the PLUS Ratings and Risk Scores in our impartial peer-to-peer lending comparison tables.